Just a quick note to let you know that Jim and I will be on Teresa Tudury's radio show, "Live from the Doublewide" on KOWS Radio out of Occidental starting at about 8:30 tonight (Nov 21st). Teresa is a remarkably talented singer-songwriter & performer. Her long-running radio show features music and wry chat with a focus on singer-songwriters. Click here to stream the show live. And then on Sunday from 4pm to 6pm, we're taking the MetaQuizzical Cafe to the Occidental Center for the Arts. Admission is $10. Tickets will be available at the door; or you can purchase tickets in advance, here. 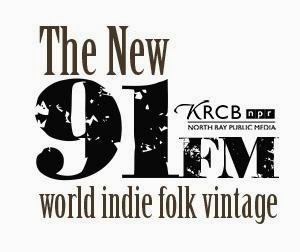 Check out KRCB's New 91FM! Jim and I had the pleasure of spending some time with the wonderfully warm folks at KRCB radio in Rhonert Park this past Tuesday. We were there to be interviewed by Roland Jacopetti for the "Sonoma Spotlight" program in advance of our upcoming gig at Occidental Center for the Arts on Sunday November 24th. 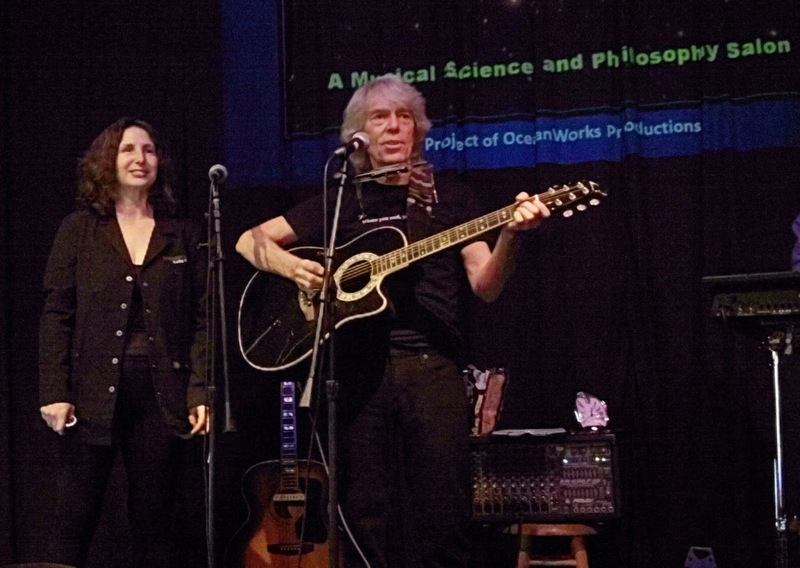 While we were there, FM program director Robin Pressman was curious about the CD we had in our hands--the pre-release of "Math2Metaphor"--our new collection of science songs. She asked if we'd stick around to chat a bit and play a tune live on her noon-time show, which we happily did. KRCB has recently undergone an exciting makeover. The new KRCB radio is live and local, offering a wide spectrum of music that is underrepresented in the commercial radio band, including indie and world, folk and vintage Americana. They'll also highlight the vibrant North Bay music scene and, in their news programs, provide a voice for local community concerns. As long-time advocates for original music and their makers, Jim and I applaud this win for the North Bay community. Check them out on the web and stream the station live. The MetaQuizzical Cafe served up its mysterious entrees--which included "Plastilla", the "First to go Under", and the "Alien Immigrant Song"--our parody of Led Zeppelin's "Immigrant Song" about alien invasion--to a full house at Armando's in Martinez last Sunday afternoon. With Lou Esposito on electronic percussion and David Correa on guitar--along with Kathy & myself, we were rockin' those science songs. We tried our first multi-media presentation in conjunction with the songs and had some fascinating and funny results. My favorite was the idea that Mars is the new Utah. Kathy put a picture of Mars taken by the Curiosity rover next to a familiar picture of Utah and the similarities are quite striking. One of our goals is to show the connectedness we have to such places. As our consciousness expands such faraway places seem closer and more compelling. The human race needs places where we can feel a new sense of wilderness and adventure. Perhaps a member of the audience summed it up best: "Wow! What a Quizzical Show you guys put on! Complete with pleats in the screen back and flying chocolate kisses! I wasn't sure if I was in a folk/rock/guitar show or Mrs. Richardson's Science Class! Toad dissections could be next?" Thank you to everyone who chose our show over the 49ers game. Calling all people who enjoy satire, science, politics--and song-writing subjects--that are intentionally and savagely anti-commercial. If you avoid the main stream like a salmon turning away from a sewage line, then we have a couple of shows for you. We're presenting two "MetaQuizzical Cafe's"--stimulating, folk-rocking romps through science, politics, satire and spirit--which feature the two of us, plus a host of our overly talented friends. The first show will be at Armando's in Martinez on Sunday, November 10th, 4 to 6pm; the second will be at the Occidental Center for the Arts in lovely Occidental (near Sebastopol) Sunday, November 24th, from 4 to 6pm. Admission to either show is $10. Tickets will be available at the door, plus you can purchase tickets in advance for the Occidental performance, here. More information about the shows are on our website or here for the Armando's show or here for the show at the Occidental Center for the Arts. So mark your calendars, make your reservation and save your appetite to sample something quirky and different at the 'The MetaQuizzical Cafe'--where Carl Sagan will meet you at the door, Rod Serling will show you to your seat, and Tom Lehrer's in the kitchen stirring the Endless Onion Soup. We recently opened for the History Connection's tribute to Shuttle Astronaut Rex Walheim on the occasion of City of Petaluma's proclamation of Rex Walheim Day. Walheim is a NASA mission specialist and was on the last ride of the space shuttle. What a nice guy! Rex has also distinguished himself as a marathon space walker having clocked the equivalent of 36 days floating outside the capsule tethered only to a thin line. He related a harrowing tale of working outside the International Space Station and momentarily thinking he'd forgotten to hook himself to the station's safety latch. And so by primate association, we were white knuckling it with a little extra intensity as we watched the film 'Gravity'. In other news the Fresno Unified School District turned our song "Plastilla!" into curriculum for science and language. The Great Pacific Garbage Patch is a huge environmental challenge for this and future generations. Here's the video they made of "Plastilla!". Show your kids.